Theme: A musical instrument made with only local materials, that is, resources which exist within your local geography and are not imported. Material cost not to exceed $100. You may build as many as you like (or as you dare)! You should start a separate discussion for each, and you may start your instrument at any time during this challenge. Starting on the 1st is not a requirement. If you are in doubt regarding the value of your materials, please ask ASAP so you don't find yourself over the $100 limit because you counted as free the expensive planetary tuners you received as a gift. Gifts must be counted at their retail value. Please note that shipping costs are *not* included in your materials costs. Neither is the cost of strings, so go ahead and build that upright bass you've been dreaming of! You may use scrounged, scrap, and discarded materials, but if you declare as free the $100 flame maple neck blank that you rejected for a $2,000 instrument because of a 1/8" bark incursion, we will cry foul. Any part rejected for another instrument for purely cosmetic reasons must be counted at actual cost. You may also be handicapped a certain amount of money or time for using a pre-made part scrounged from some other project. The staff will ask for suggestions from participants regarding the value of parts and the legality of questionable actions when such questions arise, but final decisions will be made by the staff, and are final. We do *not* count as "illegal" pre-slotted fretboards, pre-joined plates, or linings that you purchased already kerfed. We will not be subjecting our participants to lots of rules or restrictions. The purpose of the challenge is to get people building, not to award a prize. We don't care what you do or how conventional/unconventional your approach is. Just build something. At the end of the challenge, all those who *completed* their instrument, plus staff, will vote on their three favorite instruments, and judging criteria will be left entirely up to you. Here's how to enter. You must start a discussion in this section with the title "$100 Local Materials Challenge: Your Instrument - Your Name" *AFTER* 12:00:01 a.m.on April 1st. You must post the instrument you intend to build, projected materials list and costs, a picture of your materials pile if you can, definitely pictures as you go, and you may *not* post a claim that you have finished on time without posting the images to prove it, so leave yourself time at the end to process some images and upload them before the deadline. You must also post a final accounting if your original materials list changed. Your instrument must have finish applied, and be playable, or it will not count as completed. And it must come in at or below US $100 or you will be disqualified from the final judging. We do *not* require you to post a sound file. Ask questions here. I've set up a subforum to hold everyone's posts once the challenge kicks off. Last edited by Charlie Schultz on Sun Mar 25, 2012 4:53 pm, edited 4 times in total. Reason: Refined challenge, changed rules, added dates. I like it...Being in the Mountain west with the Pine Beetle problem, I think I may have to make a "Beetle Bass"
Are tuners, fretwire, strings and finish allowed to be imported. Pretty sure I can't find locally made for these. Hi Charlie: Happy to see we have a new challange coming up. I have a few questions. First, do we have to show that the wood we use came from our area, or just that it grows in our area. For example, I live in the foothills above Los Angeles, California, and there are pine and wanut groves nearby, I have walnut and pine, but I don't know if my particular boards came from this area? Also, how close is "in our area", California is famous for its redwood, and I have some nice redwood, but the redwood forests are a few hours north of here. I also wonder about tuners, I don't know of any tuning machines made in LA. One last question, it's time for me to renew my membership, I don't see a link to membership renewal on the new forum, how do I go about this. Thanks for your help, I enjoy this forum very much. Yes, those can be imported. The intent is to use as many local materials as possible. Likely most people don't have lac bugs in their backyards. Do keep track of what components are locally sourced! First, do we have to show that the wood we use came from our area, or just that it grows in our area. For example, I live in the foothills above Los Angeles, California, and there are pine and wanut groves nearby, I have walnut and pine, but I don't know if my particular boards came from this area? We're on the honor system here so you don't have to submit proof. We're looking for using material that is occurring naturally in your location, so if pine and walnut are indigenous to your area that is sufficient. You do not have to prove exactly where your board came from. As above, do keep track of what components are locally sourced! Also, how close is "in our area", California is famous for its redwood, and I have some nice redwood, but the redwood forests are a few hours north of here. I think that's close enough. I don't see a link to membership renewal on the new forum, how do I go about this. Thanks for asking- if you go to the top page ("board index") and scroll down to the bottom, you'll see a PayPal "Donate" button. I think this is going to be a really fun challenge! Thats some tightly flamed maple (you can't really make it out, but its on the workbench there), a nice thick board of European walnut, and a slab of Karelian birch (Masur birch). Its all plenty dry and ready to go. It wasn't cheap but I have some tricks up my sleeve that may let me fit within budget even with some high quality wood. Maple grows here in Finland, so this could well be local, and the Karelian birch is definitely local. Walnut grows here, but I don't know for sure if this was locally grown or if it is even of one of the varieties that grows here. I guess this is similar to Patrick's case, but do you think I'd be alright to use this stuff in an entry? It is worth pointing out that we're at a handicap on this side of the pond, all supplies are significantly more expensive here than they are in the US. I didn't see anything in the rules above mentioning entry fees. Will there be a fee for this challenge? No fees for this challenge. Likely most people don't have lac bugs in their backyards. Whoa! Wouldn't that be cool! Well, maybe between climate chance, and free trade, those little buggers will find there way to our shores and join the emerald ash borer, zebra mussel and all the rest. At least lac bugs we could make use of! I'm ready! This will be a fun one. Tristan, that wood looks great. It looks like I'll have to drive to Lahti someday as well. It seems the challenge sub-forum is locked? I tried to post some pics of my materials but maybe I'm missing something? Oho, sorry- it's open now! For this challenge I am going to build two instruments. This one is going to be an OM made from some very nice walnut I bought last year on sale. I looked through about 70 boards and found three that were well quarter sawn. I am going to use california redwood for the soundboard, and some oak for trim, and some of the neck panels. 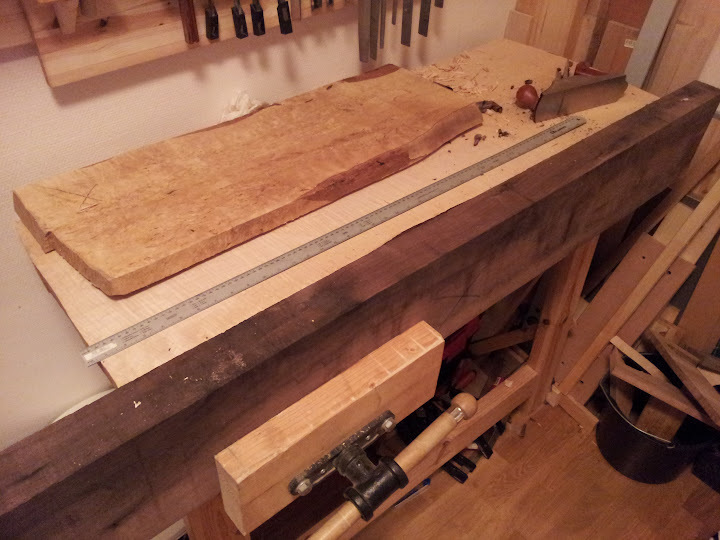 I am going to use the walnut for the bridge and fretboard as well. I am not sure how much thicker I have to make the redwood soundboard. I know that it is not as stiff as spruce, and should be made thicker, but I am not sure how much. If anybody has any thoughts on using redwood I would like to hear about it. Here is a picture of some of the materials I am going to use. $100 Local Materials Challenge,Patrick DeGreve's Pine walnut Les Paul Jr.
For my second build, I plan to build my first electric. I have plans for a Les Paul Jr. double cut-a-way. I bought Melvyn Hiscock's book "Make Your Own Electric Guitar", and have been following the "Solid Body" discussions on this forum for the last year. I guess this a good time to jump in. I am going to use a large piece of pine (1 3/4" X 18" X 24") that I pulled out of the trash at work, for the body, and a piece of the walnut I bought last year for the drop top. The neck will be walnut and oak like the OM I am making for this challenge. I bought a set of P90 pickups, and a tune-a-matic bridge on Ebay, and a set of tuners. Here is a picture of my materials. There is a lot of variation in redwood, so you need to judge each piece on its own but 10% thicker is a good place to start. Good luck! Walnut and redwood is a great combination. I kind of suggested the local materials challange (indigenous) and now I'm sitting here wishing I could participate in this one. Springtime is just way too busy for me to add another project. I'll have fun watching the progress though. so hows everyone doing with your builds. Not sure if I will be able to make the dead line with mine. I miss some building time do to sickness. It will be close if I do make it. I do have Pics of the build. will post later.